A gorgeous Amish entryway unit came to live with us last month, and my mom asked if I'd be willing to make a patchwork pad for the bench. 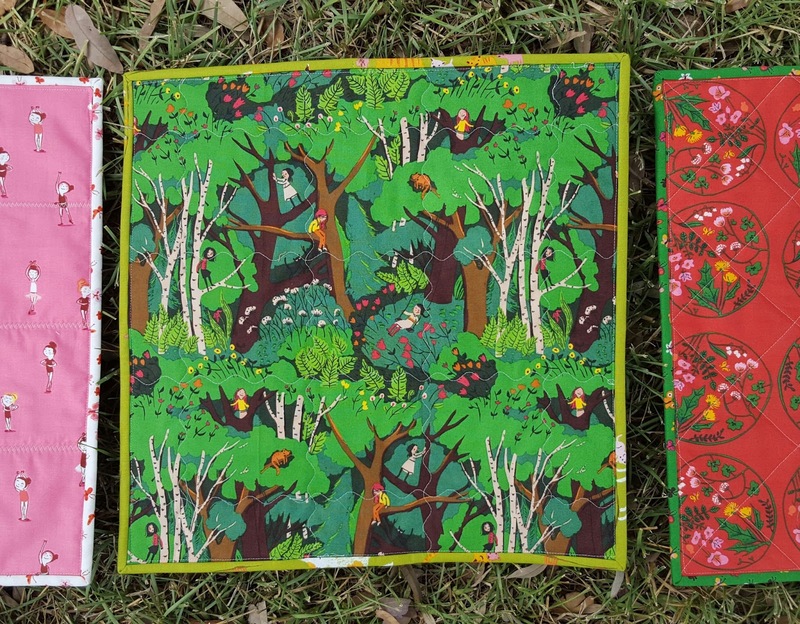 Nothing seemed more appropriate than to pull out a stack of my favorite Denyse Schmidt prints and start sewing. After measuring the space, I decided that 3 x 4" finished rectangles would be a good choice for my blocks. I most often work with squares, but it was nice to mix things up a little this time. 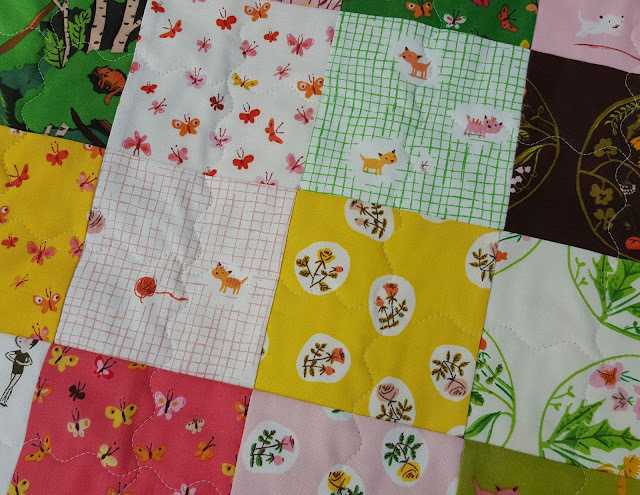 As I mentioned in my progress photos on Instagram, randomly placed patchwork blocks may look simple, but it takes me hours to settle on an arrangement. 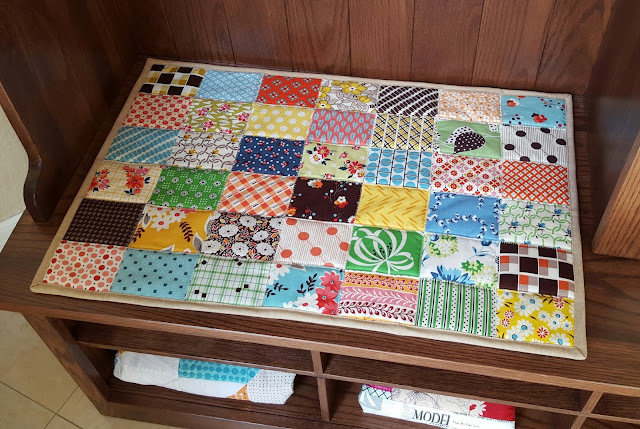 I came back to my sewing table at least a dozen times to play with these blocks before I was done -- and even then I switched a few around while I was finally sewing them together. I used two layers of heavy batting to give this piece a little more padding and quilted it with a zig-zag stitch along the seams. I like the way it gives the cushion an old-fashioned look, making it appear slightly tufted. The pad is backed in another favorite Denyse Schmidt print, and it's bound in yarn dyed Essex linen. Although technically this piece is reversible, I expect that we'll be keeping the colorful side up most of the time. It's been a while since I've sewed with my daughters. With the move, I just haven't had the time. But earlier this year when I first laid eyes on Heather Ross's Tiger Lily collection, I knew that this would give the girls and me something to look forward to. After weeks of hearing little voices ask, "Is it here yet, Mommy?" our package showed up earlier this month, and last Friday we finally sat down to sew. My girls wanted to make doll quilts for their American Girl friends, so after measuring their IKEA toy beds, I decided we would make simple patchwork quilts using 16 blocks, each a finished 4" square. I cut a stack of squares for each girl which they got to arrange any way they wanted. It was fun to observe my daughters as they walked through this creative experience, especially since they're at least a year older since the last time we sewed together. They were all big fans of the planning stage. Bunny even brought her doll in to consult on placement decisions. Bear put in a lot of time on arranging before finally coming to me with a brown square and saying, "Mommy, I don't mean to hurt your feelings, but this fabric isn't really my style." We quickly replaced it with something pink. 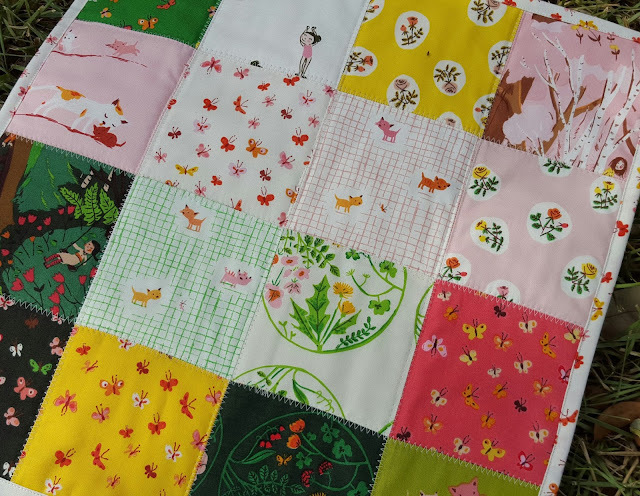 Mouse insisted that she had a matching theme to her quilt, since she tried to make sure that similar designs in different colorways were placed right next to each other. For the first time, I let Bunny sew by herself at the machine while I watched, and she was so proud. 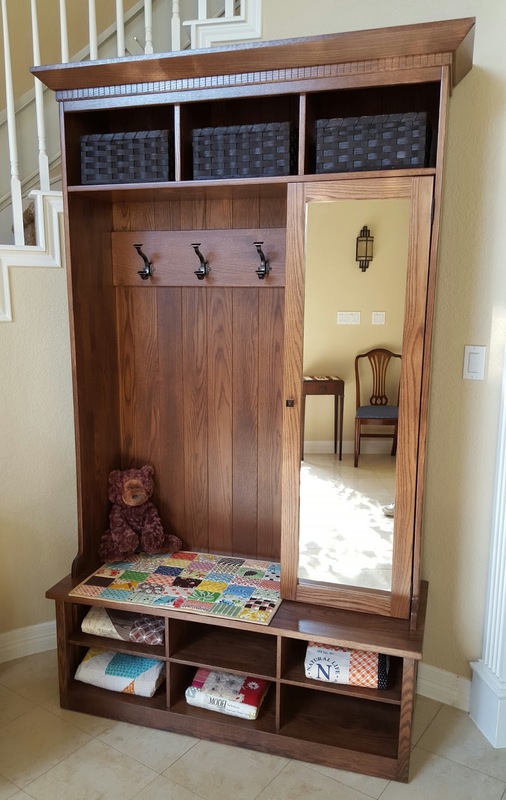 I got to hear all the details about a future sewing room of her own. This girl has big plans, let me tell you. Bear and Mouse both sat on my lap during their turns, placing their hands over mine while we sewed and quilted together. I let Bear take the wheel for a few seconds here and there, but it was definitely a team effort. We decided to do a different style of quilting for each quilt. 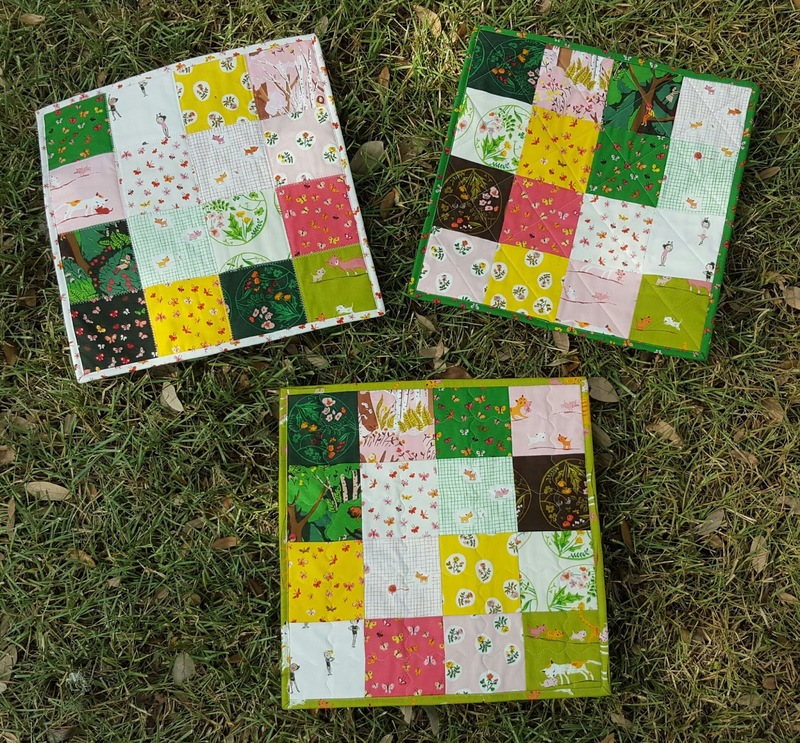 Bunny chose wavy lines, Bear used a zig-zag stitch, and Mouse had simple diagonal lines across the squares. 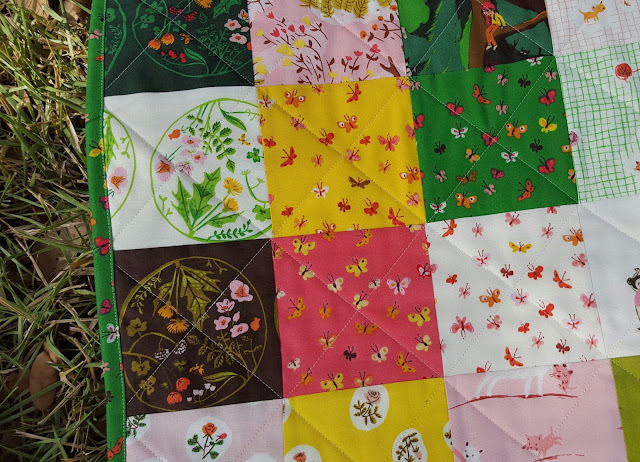 I've found that even though kids can tell their projects apart by the arrangement of the quilt top, it helps to use variety in the quilting designs too. 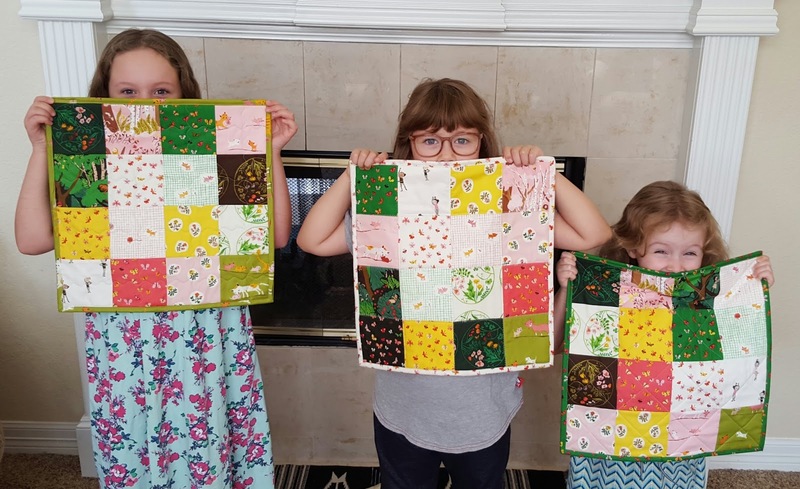 The bottom line: sewing with kids is not really something you do for relaxation, because honestly, that's not the point. It's always a challenge to keep little hands away from the hot iron, to explain what a bobbin does for the fifteenth time, to make your peace with a five-year-old's design decisions and the inevitable mismatched seams. But time spent sharing your passion with your children and seeing it become their passion as well...it's time you'll never regret. 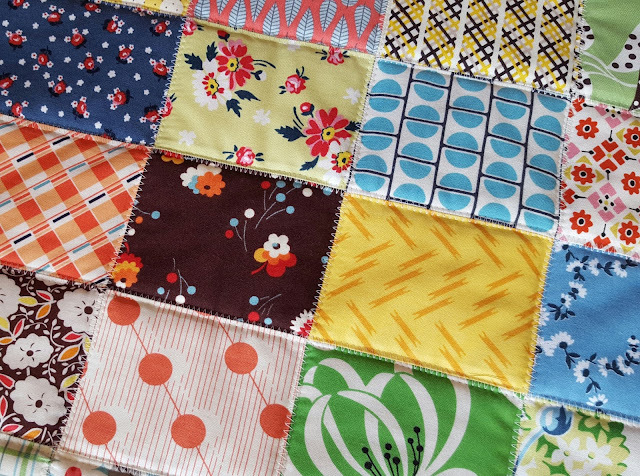 Celebrate the end of National Sewing Month by sewing with a kid. I promise, you won't be bored. 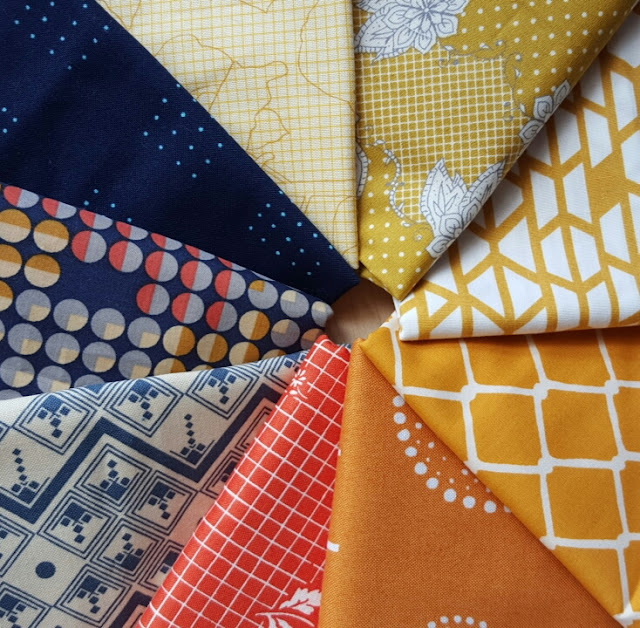 I'm so happy to be a part of the Homestead Blog Hop for my friends at Birch Fabrics today! Homestead is a sweet new collection by Emily Isabella featuring daisies, blackberries, and a cast of friendly animals in her whimsical depiction of life on the farm. 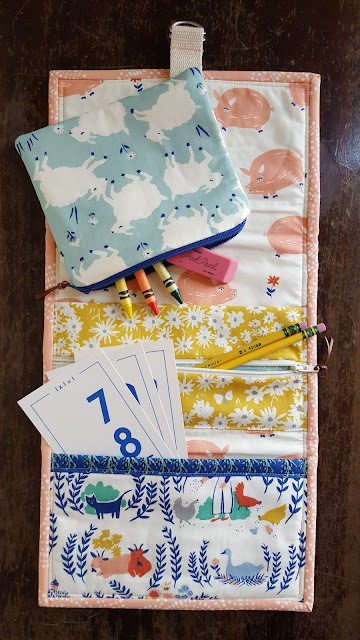 I decided to use my fabric bundle to make a modified version of the Jet-Set Case from my book, Sew Organized for the Busy Girl -- just perfect for a child's school supply pack. I can't tell you how much I love this collection's color palette. 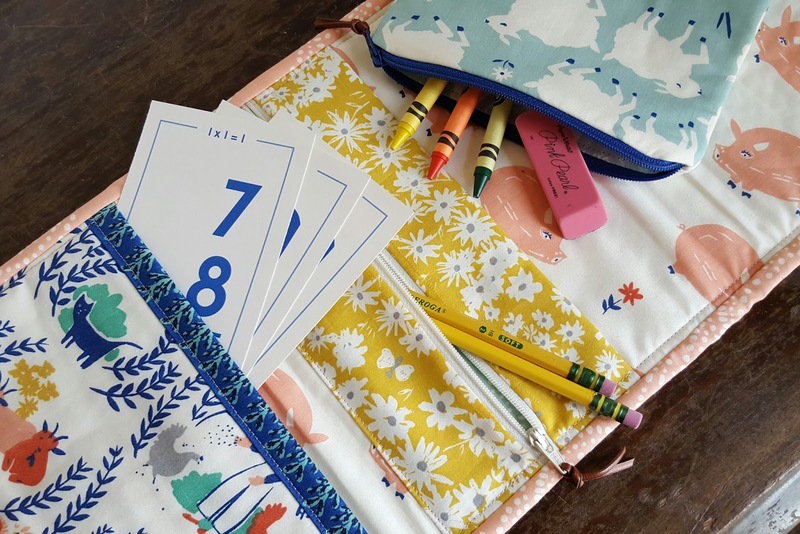 The colors are soft yet modern, and while many of the prints are child friendly, there are several that would be at home in projects for any age level. I made my Jet-Set Case a little different from the original project. The case itself is about 3" narrower, making it easier to fit inside a child's backpack. 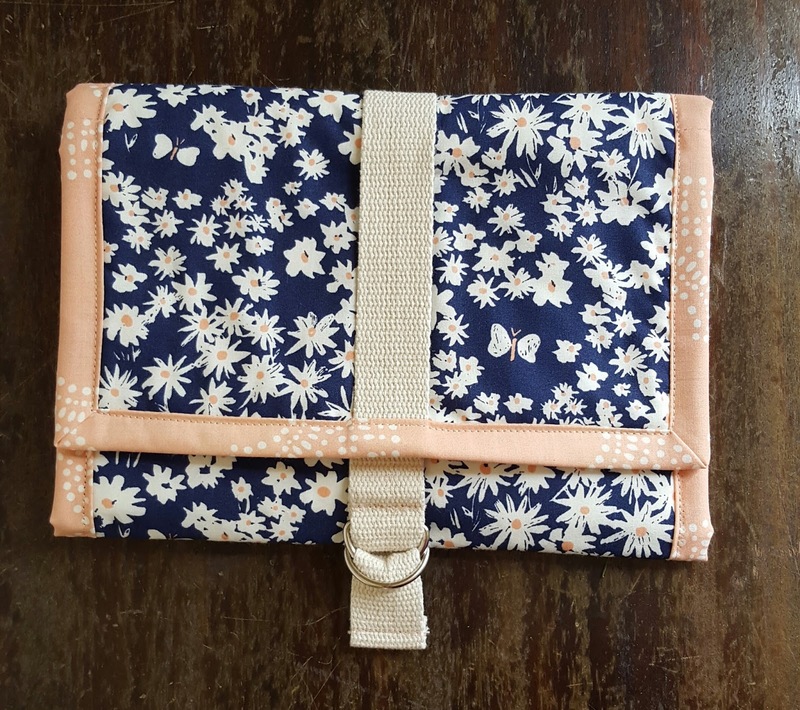 I also switched out the Velcro fastened vinyl pocket for a simple cloth pocket with no closure, making it a great place to stash a set of flashcards or a pocket journal. The zipper pocket and removable pouch are a nice size for pencils, crayons, erasers, glue sticks, and all the other tools in a typical school kit. I'm so delighted with how this project turned out, and my three girls are a little jealous that it will be heading off to the Birch Fabrics Quilt Market Booth instead of staying with us! Win 1 yard of each print from Homestead by Emily Isabella! Be sure to visit the other stops on the tour as well. All these talented people have great projects to share with you! 10/5: Simple Simon and Co.
From the moment my calendar turns to September, I'm ready to welcome fall back with open arms. That means pumpkins on my dining room table, molasses cookies in the oven, and sweaters in my closet -- even if it's still too warm to actually wear them. 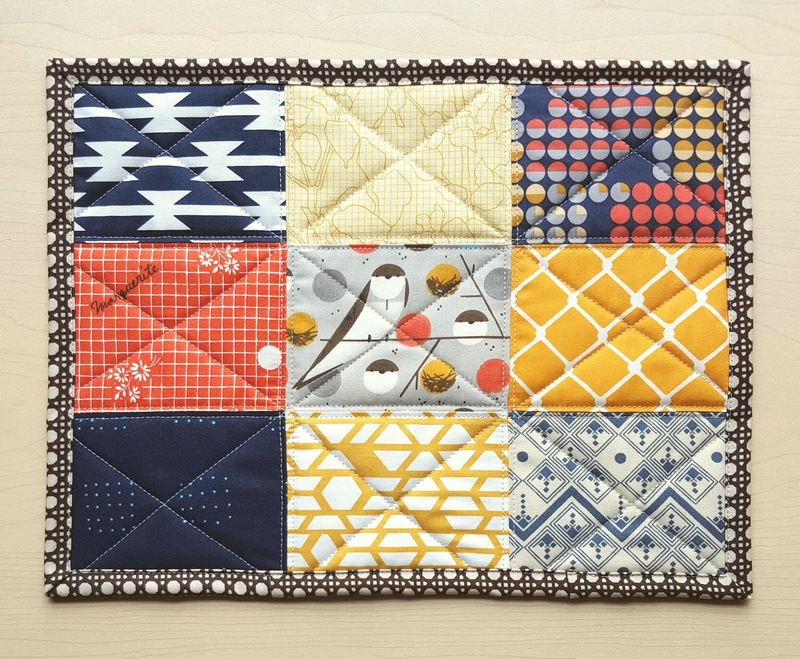 I also had fall on the brain when I was doing this week's fabric audition, a stack called Autumn Bonfire, which I put together to make a mug rug for my dad's new desk. This was the original bundle that I pulled for the project. I ended up changing a few prints slightly, but I basically stayed with this mix of gold, tangerine, and navy blue. A Charley Harper print took center stage, surrounded by the other rectangles, giving me a mat that measures approximately 9 x 12". 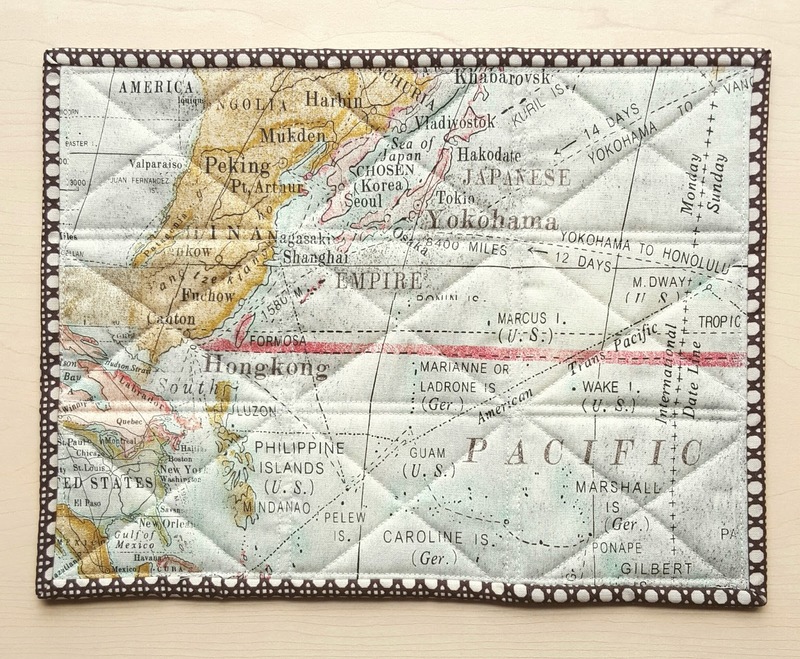 I backed the piece in a wonderful map design by Tim Holtz and used a brown wicker print by Juliana Horner for the binding. And there it is...another little glimpse of fall in my house. How I love it! My enormously talented friend Erin of Why Not Sew has written a darling book called Sweet Tweets: Simple Stitches, Whimsical Birds, and I'm so happy to be a part of her book tour today. 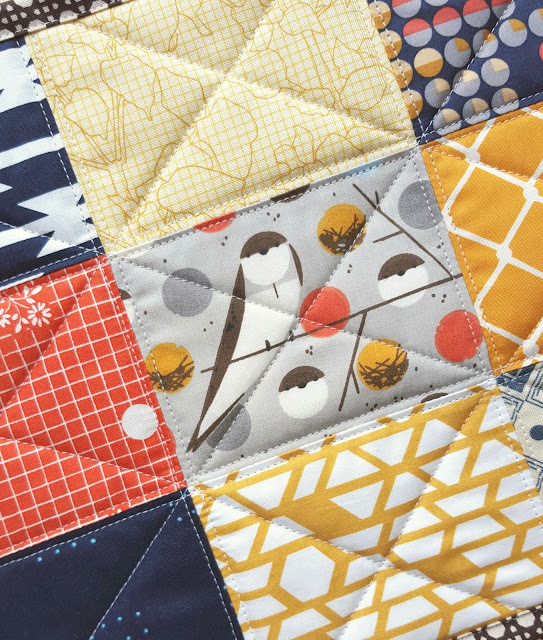 These pages are full of adorable little projects featuring vintage style patchwork and Erin's beloved little free-motion applique birds. For today's post, I chose to make the Birds & Bees Hot Pad since it featured the hand sewn hexagons that I love to stitch. I pulled lots of favorite new prints for this piece, including many designs from the Spring Cotton + Steel collections. Though I didn't have the materials on hand to do the applique in the corners of the pad as the instructions called for, I decided to use the petal templates as a guide for some hand quilting with red Aurifloss thread. I absolutely adore the way it turned out. 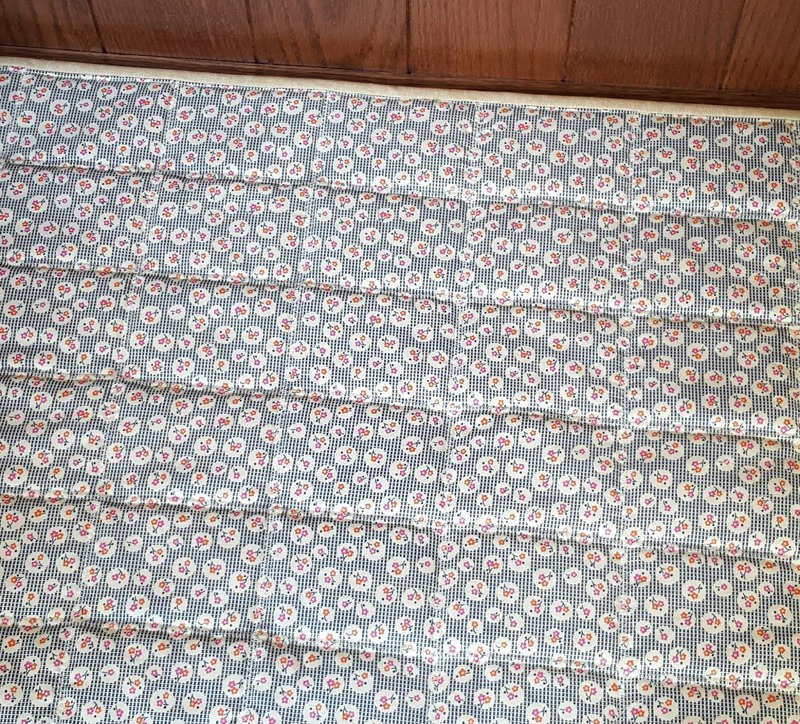 With a little navy binding to frame the edges, it makes a beautiful giant mug rug for the nightstand by my bed. I can't tell you how much I love seeing it there every day! 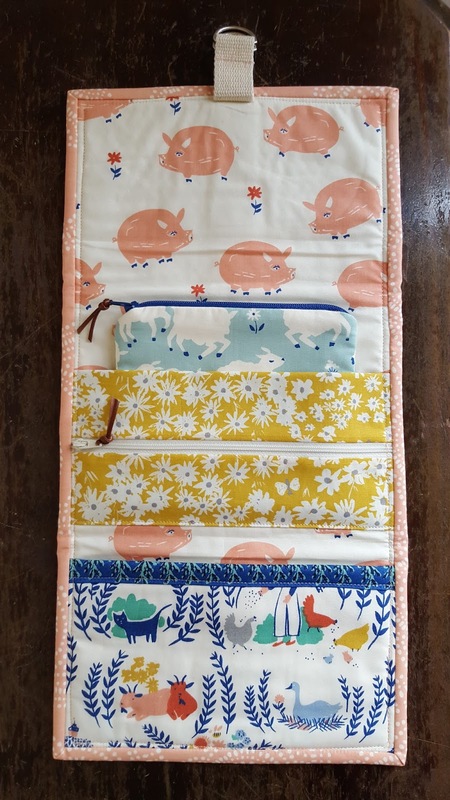 Erin's book is full of fun small projects, just perfect for the instant gratification sewing that I try to fit into each week. I love how personal each one is, and I especially admire the way she works so many special touches into each piece like optional crocheted borders and the tiniest pieces of patchwork. I will definitely be working from this book again! You can follow the rest of the tour according to the schedule below, and if you'd like to win an e-copy of Sweet Tweets for yourself, please leave a comment on this post. I'll choose a winner by Friday!